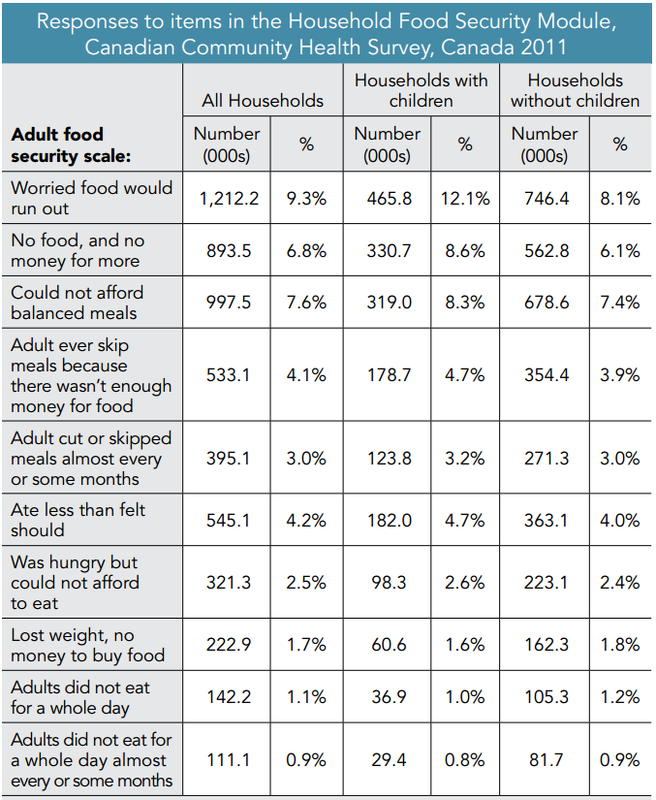 1) Food insecurity is primarily about poverty, not having enough money. 2) Food insecurity in Canada more often looks like not having quality food versus not having enough food. What we found in talking to people experiencing poverty about food was that there is actually quite a bit of food available in the community provided someone has the mobility and community knowledge to access it. There are enough food cupboards, soup kitchens, church meals, and food banks to keep one from starvation. However, living on this circuit of accessing free food means very poor quality. You will note that the primary issue is affording food, the second is the quality of food one can afford, and the third is quantity of food. To me, this highlights that the only way to truly address food security is to address poverty, everything else is a band-aid solution.